Used with permission from the author. Is St. Nicholas a wizard, a miracle worker with a special patronage to children? He is all of these things and more in legend, having lived in the fourth century, serving as a bishop of Myra in Turkey. Perhaps it is the kind countenance of this Saint in his flowing white beard and robes, always pictured bending with his staff towards children that adds to the mystery of his life on earth. He is like many other Saints where little is known of their personal lives as men and women, known instead for miraculous cures, or personal sacrifices wrought by their devotion and love for God. It is interesting that a cult has spanned through hundreds of generations and grown around this kindly Saint. Perhaps people have a deep need for this kind of benevolence so sorely lacking in the societies of today? We find this goodwill and charitable acts most abundantly during the days of Christmas when the benevolence of good St. Nick flourishes in cities and towns crossing the mountains and parting the seas of time all over the globe. For Christmas is a time when the whole world seems to stand still under the stars of our skies, in an act of reverence and awe of a Holy event where St. Nick, celebrated spokesperson of Christmas seems to have found his destiny. Just how did this come about? Well, in stages, as everything else in life, one kind act of this holy Saint building upon another until everyone in the world is whispering his name in quiet expectation of his coming on Christmas Eve night. And why so quietly the whispers of these longing hearts? Everyone knows the real meaning of Christmas in their hearts and souls, and how easy to forget the main event under a pile of bright red bows and shiny snowflake wrap. That is why St. Nick reminds us through his charity, that we must never forget the real meaning of Christmas, which is goodwill and peace towards all. And that is what St. Nick seems to be, a promoter of peace and plenty, and for those who don't have much, less is more when seen through the eyes of St. Nick. He valued life over death, health, and the nurturing of children in their innocence as Christ was born as an infant to bring the peace of heaven to earth. St. Nick is said to have healed children, and considering that in the days he lived children were baptized in large wooden vats of water, it certainly could be true that he rescued more than one child from drowning. According to more than one source he brought two boys back to life, and provided dowries for young girls to become happily married rescuing them from lives of prostitution. His compassion and kindness towards the young is what brings us the different traditions of Christmas and giving gifts to children on Christmas Eve. The religious icons in the links provided below will give you a better idea of the sanctity of St. Nicholas and the reverence bestowed upon him in numerous churches and altars throughout the world. Like the rest of the Saints he had his times of persecution, but as his cult is spread far and wide as "Father Christmas" perhaps he'd rather we remember him that way with his floating beard and sturdy cane bearing true gifts of hope, peace and joy! A few of these links and commentaries were also provided y Sheila Coyle. St. Nicholas of Myra - article in the 1908 Catholic Encyclopedia. St. Nicholas of Myra - this article by Fr. Pat Umberger, Arcadia, WI U.S.A provides a brief biogrpahical background and a fascinating story on this saint. 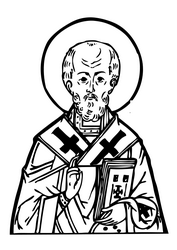 Saint Nicholas of Myra - Yet another biogrpahical sketch of Saint Nicholas with an Icon. Saint Nicholas of Myra - EWTN library - taken from "Lives of Saints", Published by John J. Crawley & Co., Inc. - Another biographical sketch. Saint Nicholas the Wonderworker Page - Icons - An Orthodox site with a large number of links to other sites containing icons of Saint Nicholas of Myra.